The impetus for much of this work is a September 2018 report entitled Losing Home, authored by the Seattle Women’s Commission and the Housing Justice Project arm of the King County Bar Association. Eviction disproportionately impacts households headed by women and under-represented minorities. 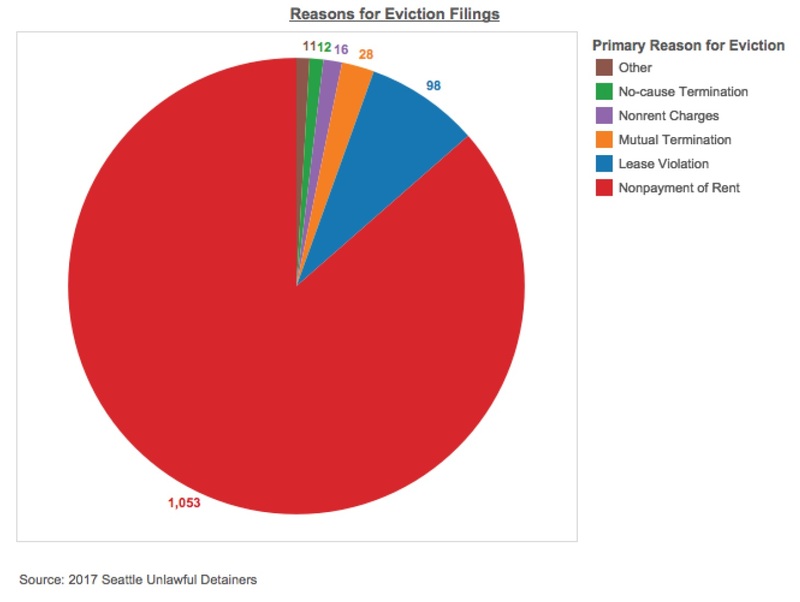 The vast majority of evictions are for nonpayment of rent. But it’s often for small amounts of rent — 1 month or less. The Seattle Times recently reported on a woman facing eviction for a rent underpayment of only $2. In other words, many landlords seemingly are rushing to evict people at the earliest opportunity. 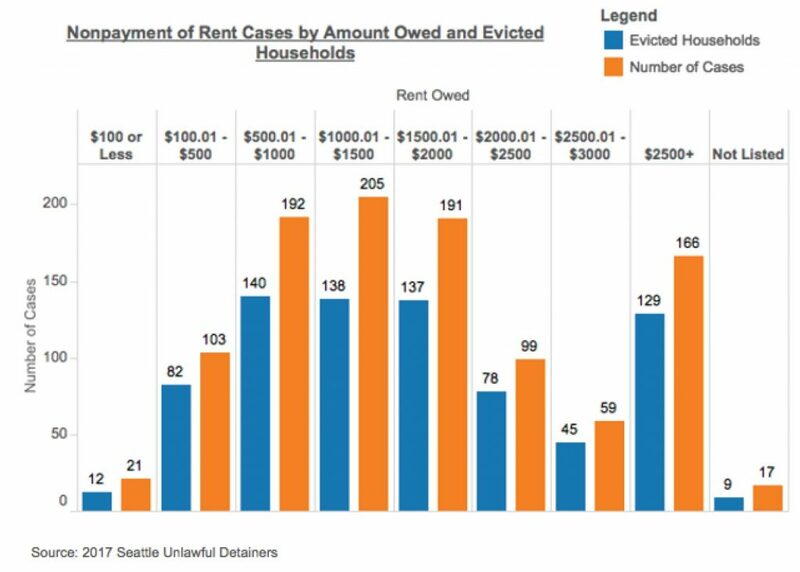 To be fair, though, the study just analyzes evictions, and provides no data on instances that stayed out of eviction proceedings because landlords provided flexibility on payment of rent — one can assume there are plenty of those that go unreported. But of the cases where eviction did happen, the landlord didn’t wait long. 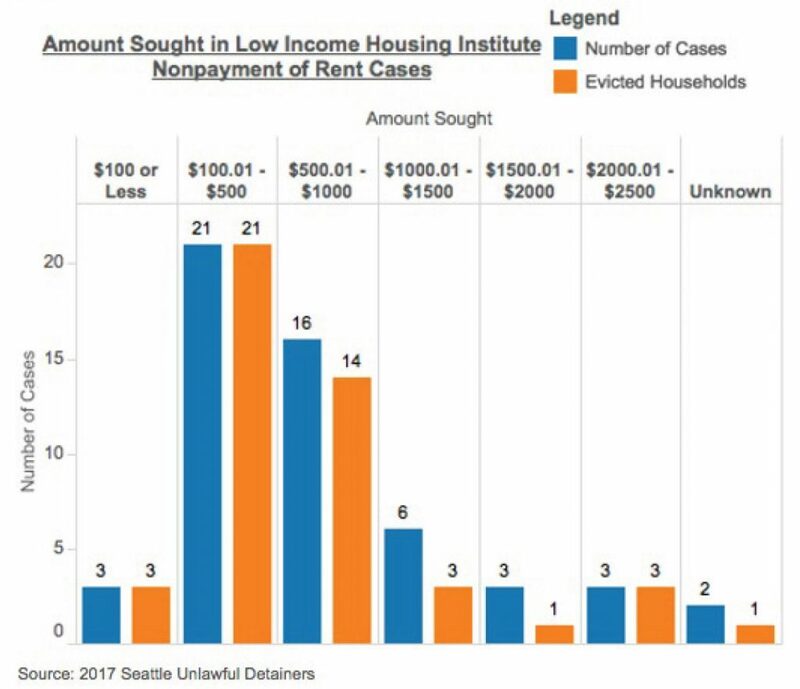 In 2017, there were 21 eviction cases filed where the amount sought was $100 or less. Additional costs such as attorneys’ fees and court costs, which landlords are allowed to seek from tenants being evicted, can be substantial. In some cases, they can be considerably more than the underpaid rent. 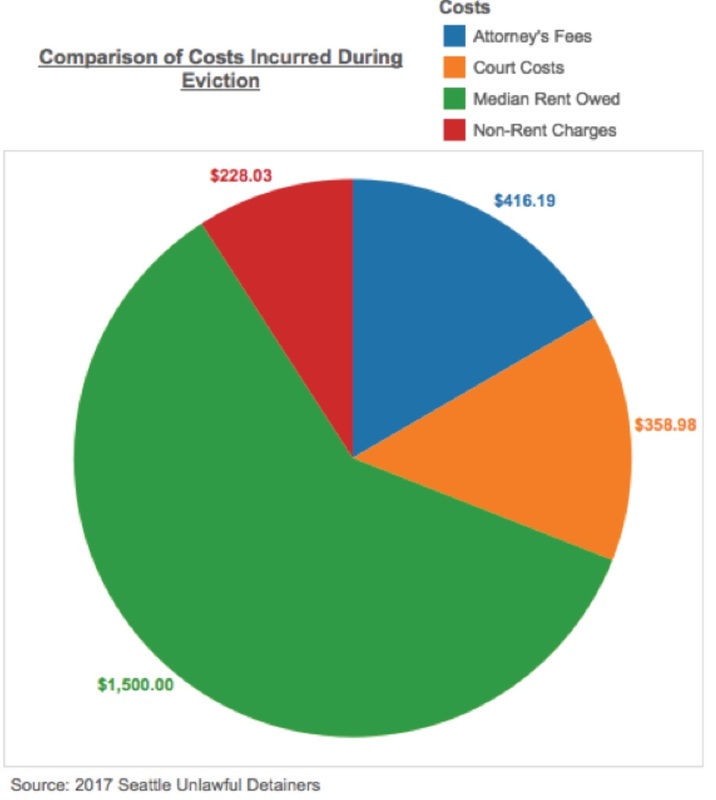 Here are the average costs: And here are a few examples from the report of outlier cases. 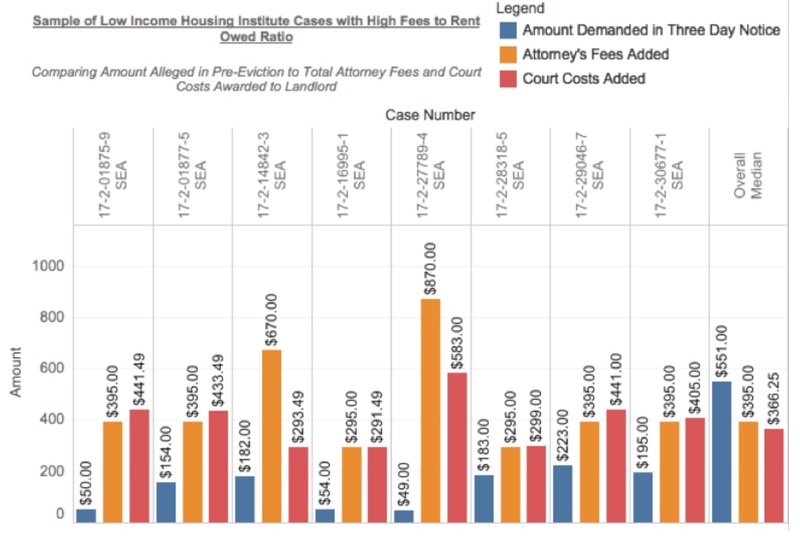 In one case, a $600 rent underpayment led to over $4,500 of additional fees. 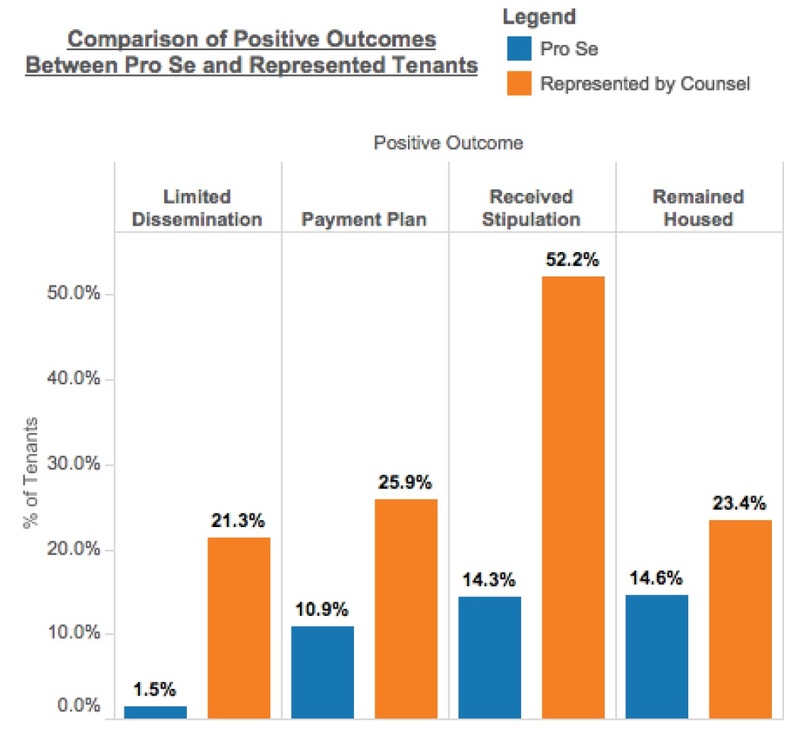 Legal representation for tenants makes a large difference in the outcome, suggesting that the eviction process is not well understood by tenants and is difficult to successfully navigate. 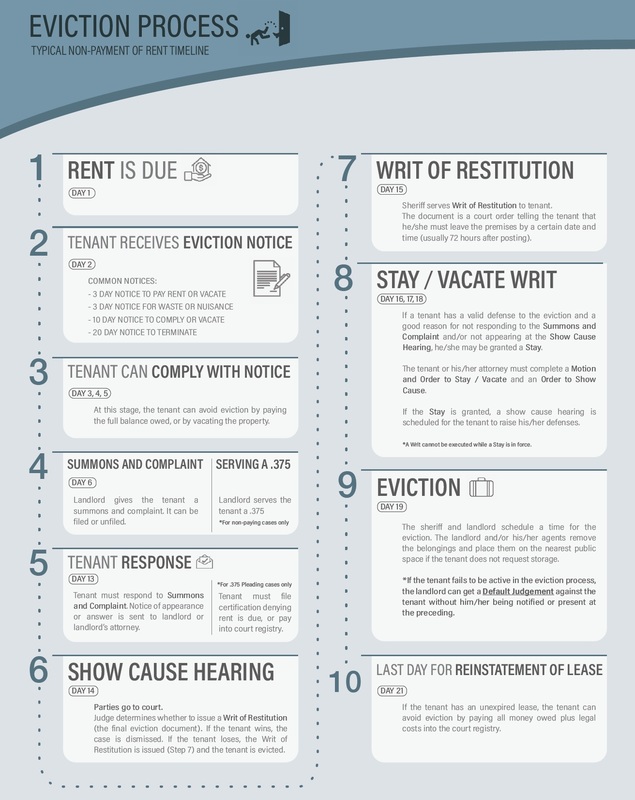 This is no surprise: from the report, here is a flowchart of the typical eviction process for non-payment of rent. A lot happens in three short weeks. The report calls out one organization in particular for what appears to be a harsh approach to eviction: the Low Income Housing Institute (LIHI). It evicted dozens of tenants from its properties for relatively small amounts of money. And in many cases it tacked on substantial additional charges, the most egregious case being $1,450 in attorneys’ fees and court costs for a $49 underpayment. The report highlights several problems with the current eviction process from the perspective of tenants, and recommends solutions — many of which require legislative action to reform current laws. Near the top of the list is that from the time a tenant receives an official notice that he or she is behind on rent, there is only a three-day window in which the landlord is required to accept payment, after which the landlord may choose to evict the tenant even if he or is able to pay. That’s not enough time to wait for the next paycheck, and despite the fact that programs assist to help tenants financially who are in danger of eviction due to nonpayment of rent, three days is often not enough time for tenants to discover and contact those programs and get the assistance in-hand to pay their rent in full. It extends the definition of “tenant” beyond the persons who signed the lease to any other occupants of the units who have co-resided with the tenants for at least six months. This is to address the case where the signed tenant moves out and the other co-occupants have no legal rights to remain in the unit. It prohibits a landlord from attempting to evict a tenant or terminate a tenancy without a court order, which may only be obtained after the landlord “pleads cause with specificity.” It goes on to list the specific types of “cause” that are allowed. It changes the rules for fixed-duration rental agreements so that they no longer terminate at the end of the specified period; instead, they automatically become month-to-month rental agreements with no end-date. Except for a few limited cases, this means that the power to end a lease would live almost entirely in the hands of tenants. Currently if a tenant files a complaint about a rental unit and in the following 90 days the landlords starts eviction proceedings for nonpayment of rent or breach of the rental agreement, there is a presumption that the eviction action was not retaliatory. That presumption is removed. Currently in an eviction proceeding, neither party may recover legal fees if those legal services were provided to them at no charge. That rule is deleted. The rules around landlords handling of the tenant’s damage deposit post-eviction are tightened, including a firm requirement for written third-party receipts or estimates for all damage charges. It extends the period for a tenant to pay rent in arrears from 3 days to 21 days after receiving a formal notice. It rewrites the required text in eviction notices to include new language that clarifies the requirements placed on tenants to participate in the process and lists where a tenant can go to get help. It specifies that continued tenancy or relief from eviction can only be conditioned on payment of rent itself, not other charges, utilities, late payment charges, legal costs, attorneys’ fees, or anything else. It also says that any payments the landlord receives must be used to pay for rent first, before being credited toward any other fees or charges due. After a judge enters a judgment in an eviction case, the eviction will not be executed for five days; and in that period, the tenant has the opportunity to pay the rent in full and have his or her tenancy restored. Again, that is just the rent and not any other fees or charges owed. For its part, the City Council seems to hope that Macri’s bills make it through the state legislature. But Council members Lisa Herbold and Mike O’Brien have brought forward their own resolution to establish an agenda for local reforms to the eviction process. That resolution passed through Herbold’s committee two weeks ago, and is up for final approval by the full Council tomorrow (Monday) afternoon. Rather than identify specific solutions, the resolution lays out several problems for the Council to tackle this year, and a couple more that form a longer-term agenda. courts generally don’t (or can’t) exercise judicial discretion, even when a tenant has good cause to be late in paying rent and can pay in full at the time of the hearing. 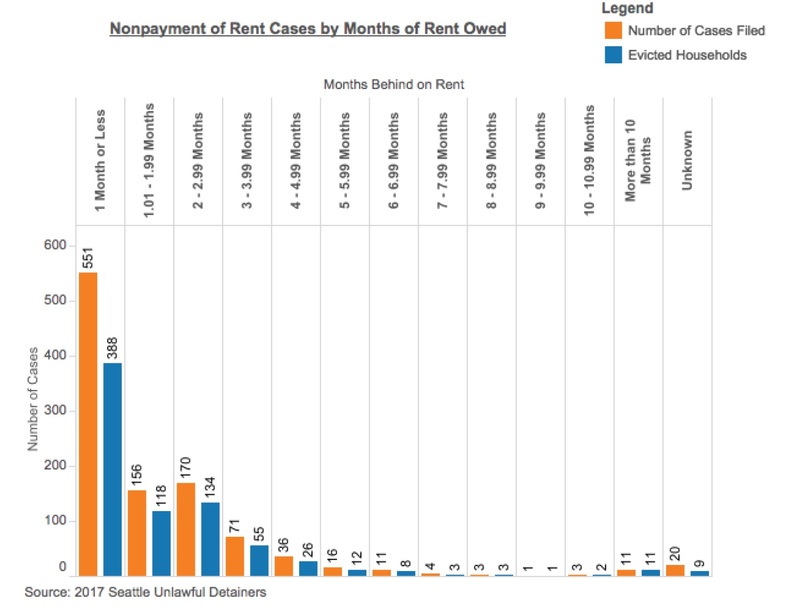 the reporting of landlord-tenant debt in credit reports, which might make it more difficult for tenants to obtain housing. 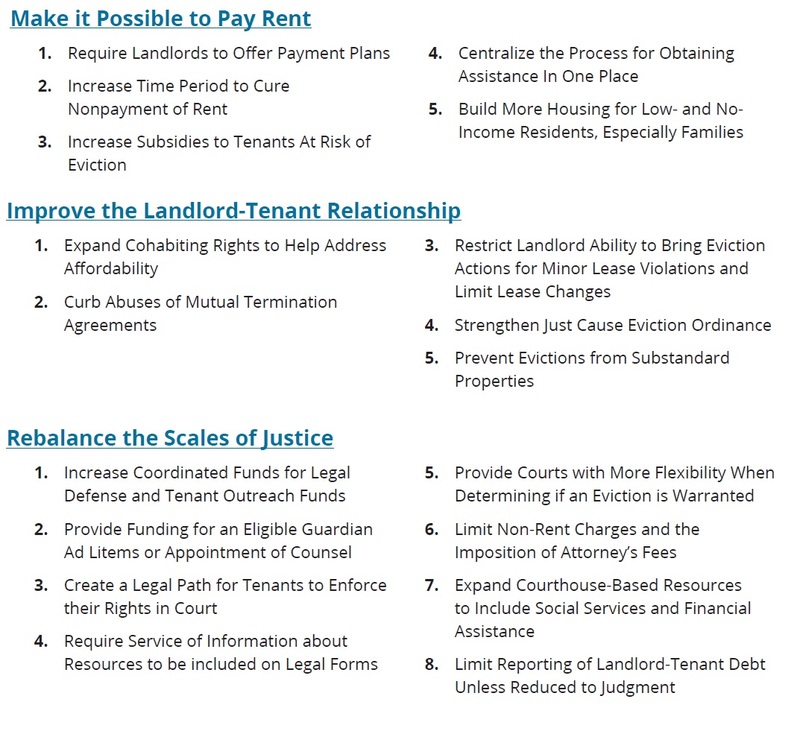 While there are many important issues to be addressed on the list and many landlord abuses to be curbed (such as excessive charges tacked on to evictions), these are also very one-sided lists that paint all landlords with the same broad brush — and assume to some extent that landlords don’t have cash-flow issues as severe as some tenants. It also continues a local trend in denying landlords the right to choose tenants (by denying them the ability to end a tenancy with a problematic tenant who might violate the spirit but not the letter of a lease agreement or who is chronically late in paying rent but never quite meets the threshold for eviction). But landlords’ rights to choose their tenants is a matter being litigated in Washington courts at the moment — and at least for the moment, the landlords are winning. That might pose a problem down the road for Macri’s bill prohibiting no-cause evictions if worded too broadly. The simple, effective solution to reducing evictions for non-payment of rent is to provide short-term, emergency rent assistance for those in need and with limited resources. RHAWA advocated that Council greatly increase this funding during its budget discussions and was roundly ignored. Short-term rental assistance works. Seattle’s own Housing Levy Report from March 2018 notes a 97% success rate at preventing eviction and homelessness. RHAWA publically supported passage of the Seattle Housing Levy in 2016 and the renewal of Bellingham’s Housing Levy in 2018 for this very reason. SCC has chosen to put zero additional dollars toward short-term rental assistance in 2019, with Councilmember Herbold instead wanting to study its efficacy – in the face of the City’s own Housing Levy Report demonstrating that short-term assistance works and preempts the eviction process all together. Interestingly, Greystone Company analyzed rental subsidies given out by cities around the country and Seattle ranked among the lowest when it comes to providing residents relief for financial emergencies that would otherwise keep them housed. Landlords are not the cause of eviction. Income inequality, and systemic economic and institutional social barriers are the drivers of the collective action problem before us. Council can best serve the City by engaging with stakeholders on all sides. Developing the best available data as a basis for policy discussions would create cogent economic outcomes for tenants while preserving Seattle’s indispensable rental housing stock. Clearly both sides are staking out positions on the ends of the spectrum. 2019 looks to be the year for eviction reform (or at least attempts), but don’t be surprised if it drags out in the courts into 2020 and beyond. In the meantime, House Bill 1453 is scheduled for a hearing in Olympia Tuesday morning, and House Bill 1656 is scheduled for its first hearing Wednesday morning. I rent three of four apartments in my fourplex home. I do not allow month to month leasing because my partner and I both work full time. It takes a lot of effort to get one tenant out and another in often requiring time off work. It’s very important that we can plan for this time. Also if a tenant decides to leave in winter, we are stuck with a limited applicant pool and indoor work on the unit. We have had tenants buy houses and take jobs in other cities, we happily work with them to come up with a fair solution. There are a few items in this post which make me question the viability of continuing to rent out my home. Isn’t ‘what is fair and just’ supposed to be what’s being delineated in this legislation? This is a huge loophole for a judge to force a landlord to bear significant cost without real recourse. How is a small landlord, say with a couple of houses or maybe just a backyard cottage, supposed to appeal such a ruling? How long are they supposed to forego rental income? Do we just assume their interests are part of the ‘fair and just’ consideration? If you had a loan payment on a cottage that you’d have difficulty carrying for a few months without rental income, would this reassure you? Otherwise it seems like a reasonable set of adjustments to current law. But the part I cited looks I real Trojan horse to stick it small landlords. You are right that it is vague and needs better language. It’s an attempt to give judges the opportunity to respond to context, where today there is no flexibility at all. So, for example, a situation where a tenant’s travel plans go horribly wrong and they can’t get home within the 3-day period — but perhaps tried to pay on day 4 but the landlord refused to accept it. Or a tenant was robbed/burglarized and the rent payment was stolen. So cases where it wasn’t the tenant’s fault but a good-faith effort was made to make good. Or the tenant paid all but $5 of the rent. Tenant advocates have pointed out that loan foreclosure takes many months, over which there is plenty of time for loan to be brought back current, compared to an eviction that can be 21 days from beginning to end (and after the 3-day “pay or vacate” notice expires the landlord is not required to accept payments). I hope it’s clear from my article that I’m sympathetic to both landlords and tenants here. 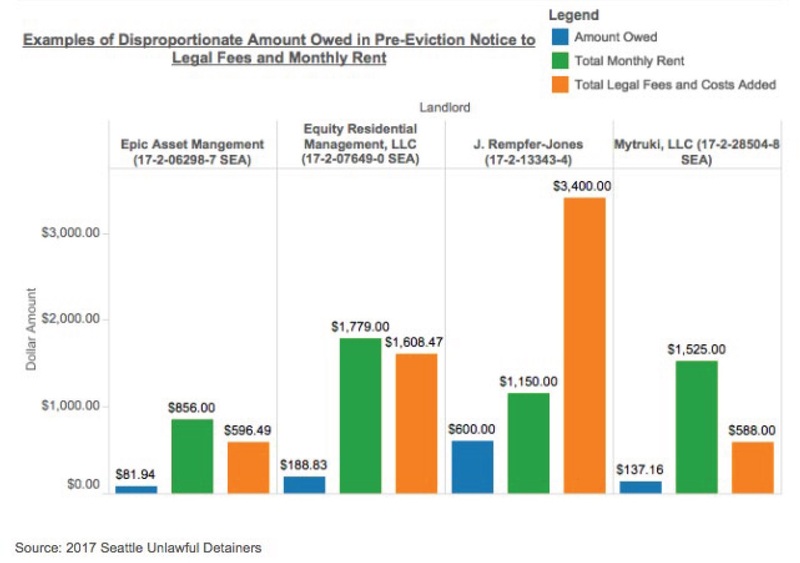 Landlords have financial hardships too and I’m not a fan of tenants making their problem the landlord’s problem instead, but the rules are so rigid right now that in many cases judges don’t have any flexibility not to approve the eviction if the landlord insists. It’s also important to keep in my that the judge would have to balance the equities between the landlord and the tenant. Considering the judiciary is fairly conservative in WA, I highly doubt that their discretion wiuld be much of an issue for small landlords.